The Mono Hot Springs Post Office is located inside the General Store. If you are a backpacker the Mono Hot Springs Post Office can be a real necessity for the pick-up of supplies. 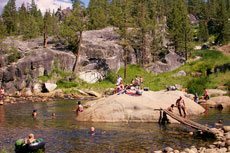 Historically, since the 1940’s, Mono Hot Springs has been a stop-over for many thousands of hikers from the John Muir and Pacific Crest Trails. Not only can backpackers and hikers pick-up their packages and letters, but they can also relax those sore muscles in the famous hot springs before the next leg of their journey. Also write the words: “HOLD UNTIL date” to waive the default 10 day hold period. There are three routes off the John Muir Trail to Mono Hot Springs. The nearest is the Edison Lake Ferry that is only about a mile off the John Muir/Pacific Crest Trails. Another popular route is to ride the Florence Lake Ferry. It is fairly easy to catch a ride to Mono from Florence Lake. Another fairly easy detour is down the Bear Creek drainage to Mono Hot Springs. Good luck on your backpacking trip and we hope to see you this summer. Call (559) 325-1710 if you have any questions. "This private hot springs resort on the edge of the Ansel Adams Wilderness might just be the ultimate tonic for city-induced stress syndrome. With hot mineral baths, massage, rustic cabins (reasonably priced), and good food, you'll decompress in no time. And nobody can beat Mono Hot Springs for location. Hiking into the John Muir Wilderness from here is extraordinary". 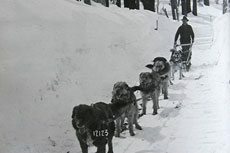 to read about Kaiser Pass Rd. 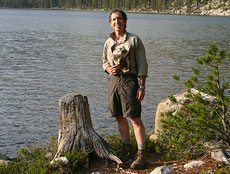 Join us this summer for Sierra hiking author Tony Krizan's photo journey of nearby hiking areas. Click here for scheduled presentations.